Mainframe computers play a central role in the daily operations of many of the world's largest corporations. Batch processing is still a fundamental, mission-critical component of the workloads that run on the mainframe. A large portion of the workload on IBM® z/OS® systems is processed in batch mode. This IBM Redbooks® publication is the first volume in a series of four in which we specifically address new technologies introduced by IBM to facilitate the use of hybrid batch applications that combine the best aspects of Java and procedural programming languages such as COBOL. This volume specifically focuses on the latest support in CICS to run batch tasks. 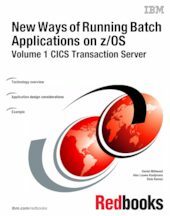 The audience for this book includes IT architects and application developers, with a focus on batch processing on the z/OS platform in a CICS environment.